To help you increase your customer ratings in the AppStore and Google Play, we analysed the reasons behind a rating. What is a good customer rating? First, we have to define what a good or a bad grade. We will use the research made by Dennis Pagano and Walid Majeeh “User Feedback in the AppStore: An Empirical Study”. 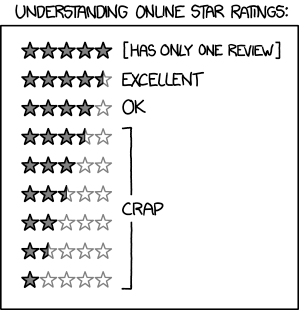 This study explains why only reviews with a rating above 4 are good for your app. The study analysed 1,126,453 reviews on 1,100 applications , 550 free and 550 paid apps. It shows 95% of the reviews with a grade of 4 or 5 express a compliment. This ratio fall to 20% when the grade is equal to 3 and 0% for 2 and 1. What is behind a good or a bad rating? 80% of the reviews are shorter than an SMS (less than 160 characters) and 99% contains less than 675 characters. 60% of the comments affect free apps and 40% paid apps. What is the main reason behind a negative comment? Two main areas of improvement for your mobile application are the UX and functionality thinking of the user first. Rick Mac Gillis is a superstar who builds rocketships and lands them on the moon in his spare time. Imagine that. He's just an extreme kind of guy! This text is included as a component with the same name as the author.